I wanted to pop in really quick and show you our new valances for the kitchen windows. 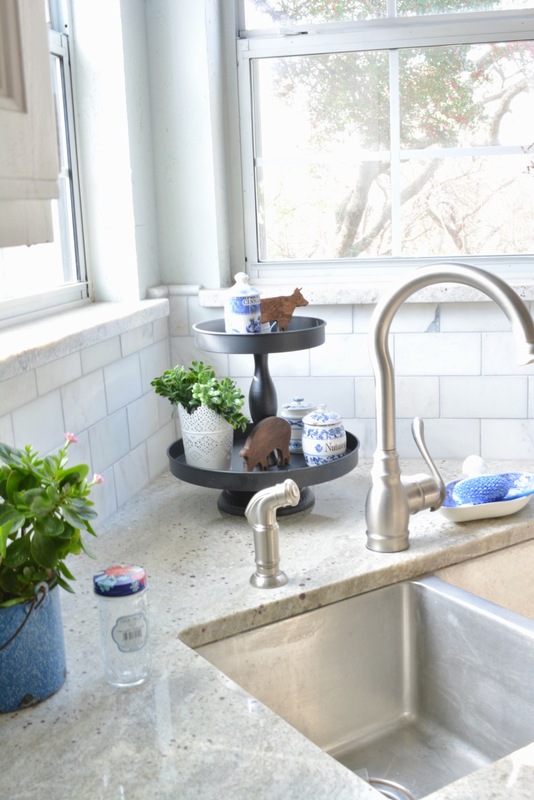 It's been about a year since I pulled all of our blue and white china pieces out of the nooks and crannies around here. 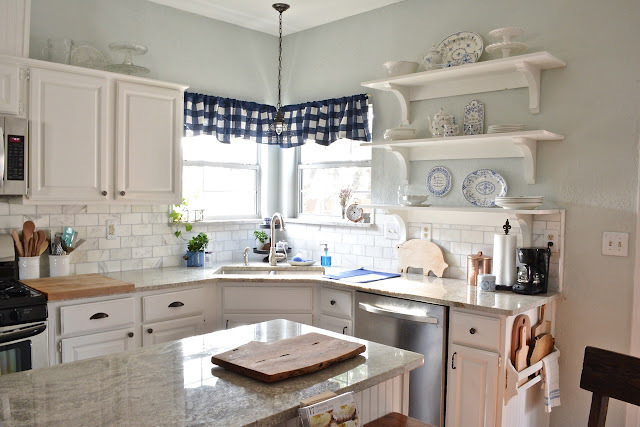 Subsequently, I've been on the hunt for more blue and white to add to our decor. 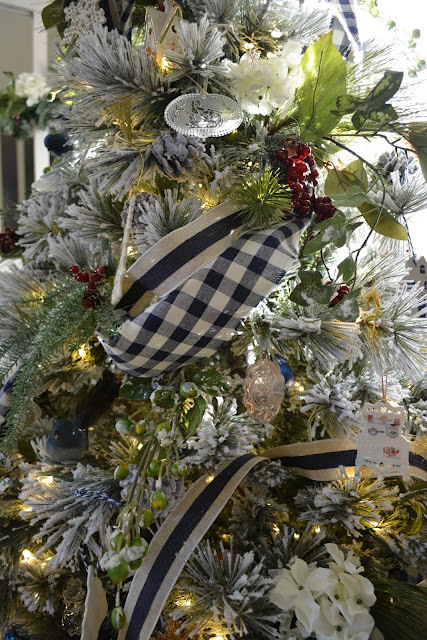 Our Christmas tree had a cute blue and white checked fabric detail. I could see both the tree and the kitchen window from my recliner. It dawned on me that some checked fabric in the kitchen window would be darling. I've been watching a fun YouTuber - here's the link. Liz found some darling valances at Walmart so I decided to have a look there. I really couldn't believe that they had exactly what I was looking for. 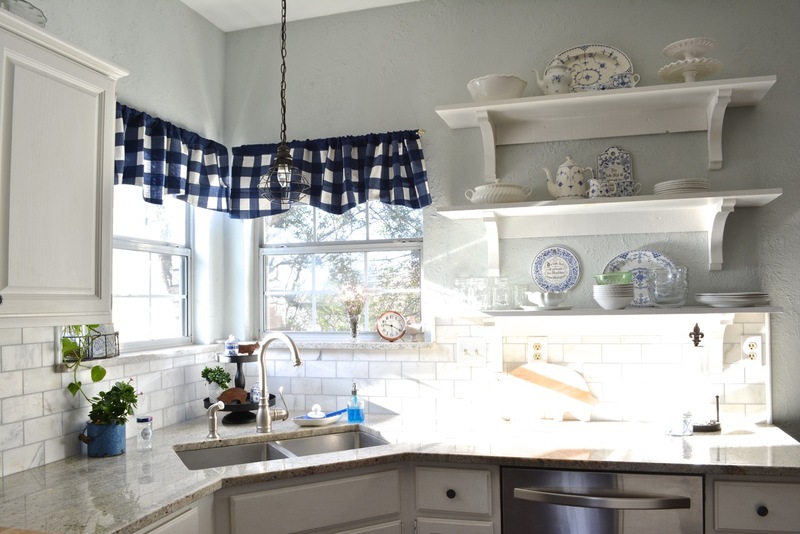 This valance came with a pair of Navy blue cafe curtains as well. Each Better Homes and Gardens set was $14.99. The cafe pairs were much too long for my windows. They would also block my view. I love looking out when I do the dishes so I don't think I'll hem them and put them up but I may use them for something else. 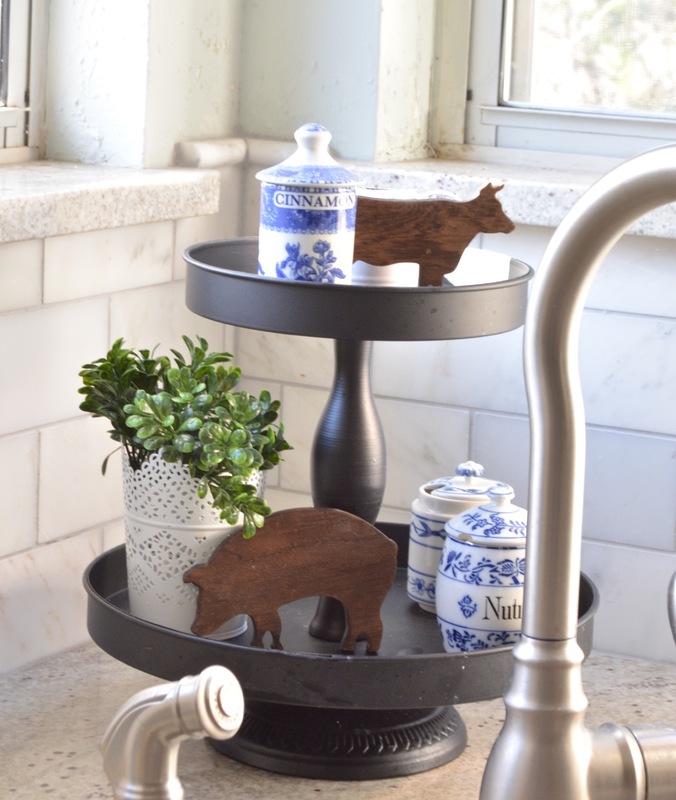 My tiered tray got a pig and cow that was sold in the craft area. I found a blue enamelware pot at the thrift store for $3.00. It was sale day so I only paid $2.25. A spice jar from Pioneer Woman sits next to it. The clock is from Walmart. The bird is from Target. 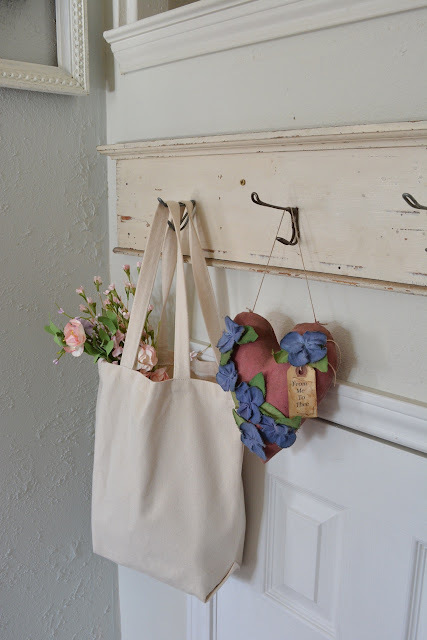 The market bag is from Hobby Lobby. The flowers were from Joann's. The heart is from my favorite crafter. That's what's going on in the kitchen. What do you think? What a cute Walmart find. Thanks for sharing your charming home with us. OH this is pretty, Katie! I love your fresh blue and white colors...and the curtains are PERFECT. 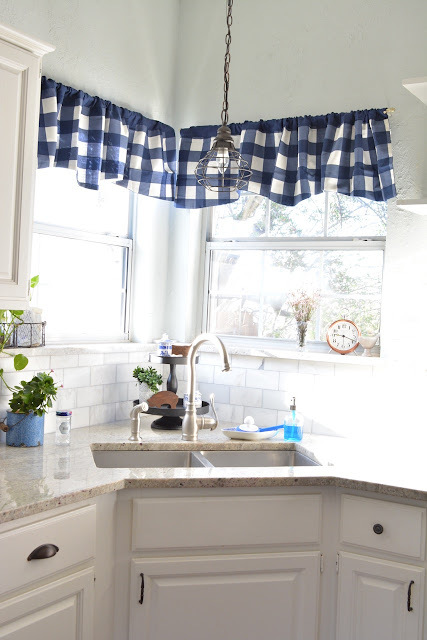 Love your kitchen and all the pretty touches; the buffalo check curtains are just what that window needed. The bread and cheese board holder on the end of your cabinet is wonderful! Like the blue and white - I made some new cafe curtains this week for my kitchen -must be the January reset time of year. I could not find what I wanted so I made them. I have some light blue buffalo check earmarked for my family room update. 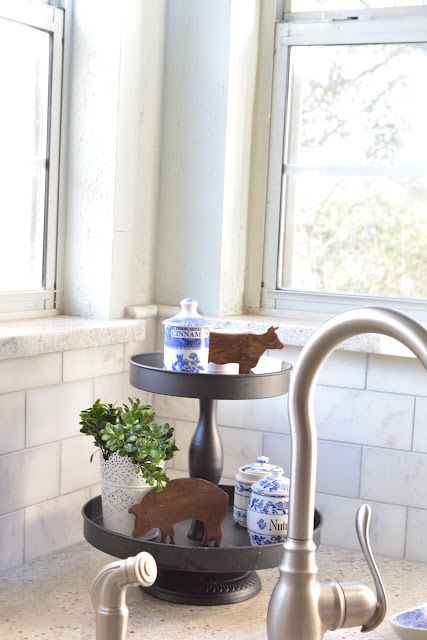 Love your kitchen. 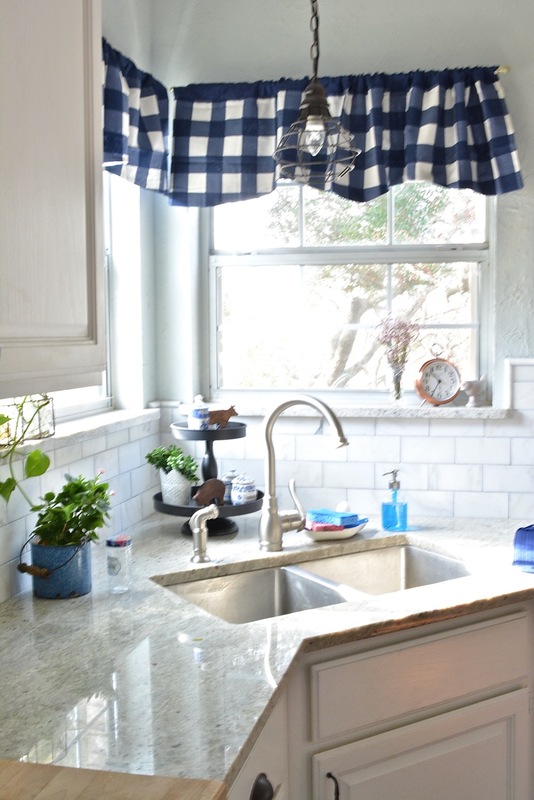 LOVE the blue & white check valances in your Kitchen window! Cute, cute, cute accessories from the Craft Department! Just a thought: sprinkle some of that blue in a runner on your table. Thank you so much, Pat. It's hard to see but there is blue in the grain sack on the table. I could probably use something that pops a little more. I'll have to dig through my linen chest. These are fabulous, Katie! I'm a blue and white fan. And what a great find! 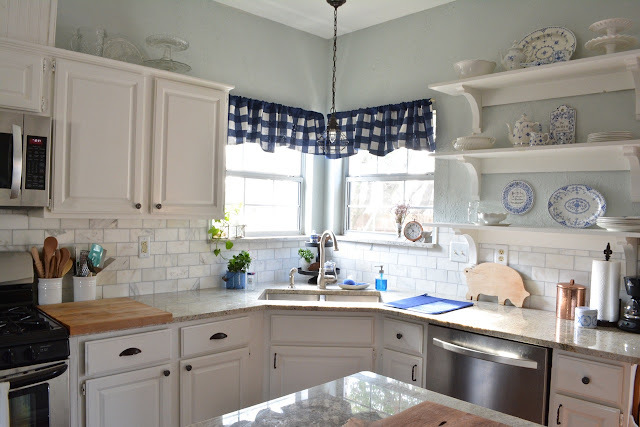 Hi Katie ... love the touches of blue in your kitchen. 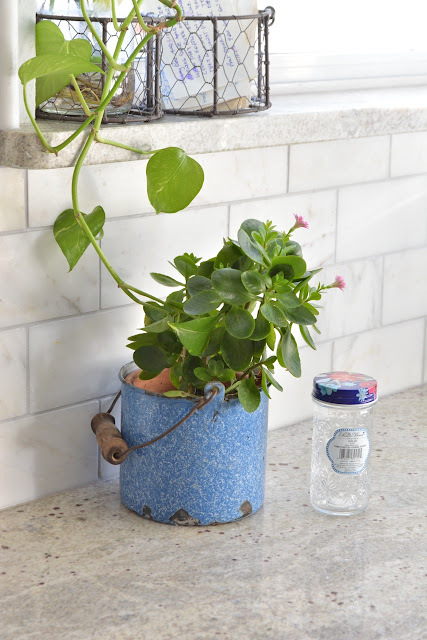 The enamel pail with the live plant is one of my favorite things. Thanks for sharing. I love blue and white together. It is always so pretty. I am thinking of adding some blue to my whites as I do my living room. I just have to find the right drapes and then go from there. 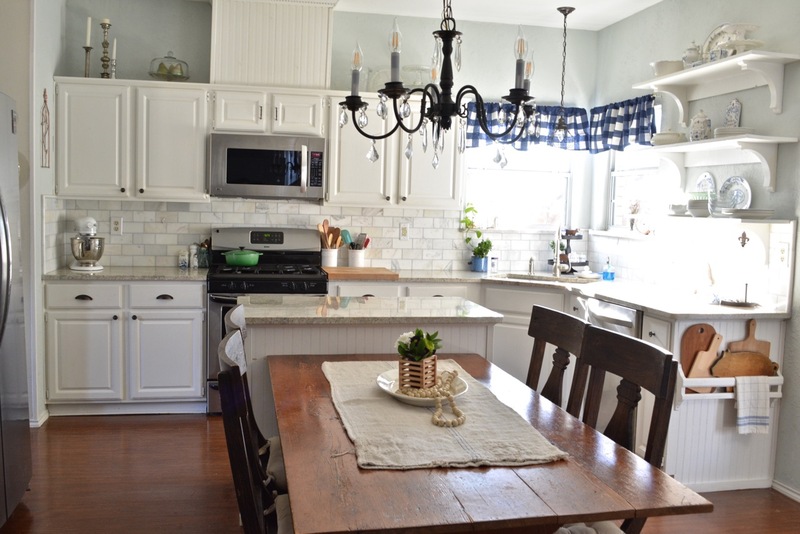 Love seeing your pretty kitchen. Have a great weekend. I am so jealous of you Texas girls and your nice weather and sunshine. We are negative numbers and lots and lots of snow. Worse part about living in the midwest. Just will be happy to see Spring and Summer. Katie I love buffalo check on everything! Navy is my favorite color, so this is a home run! 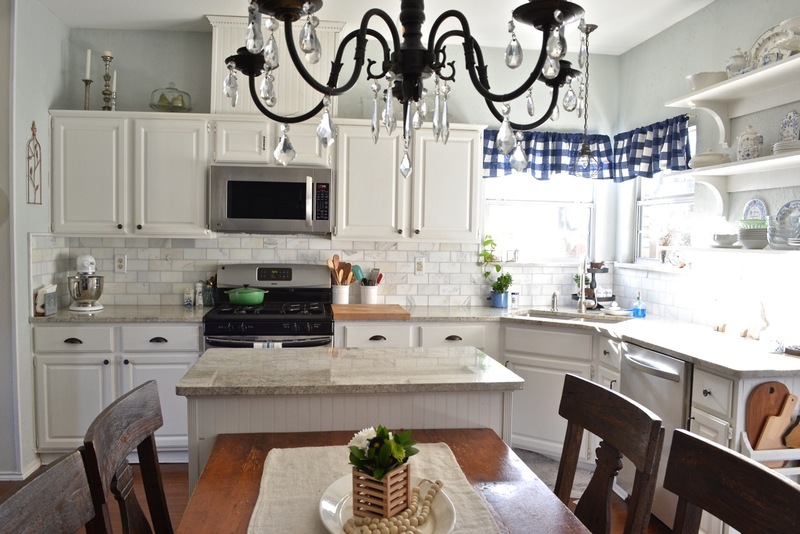 Such a pretty kitchen! 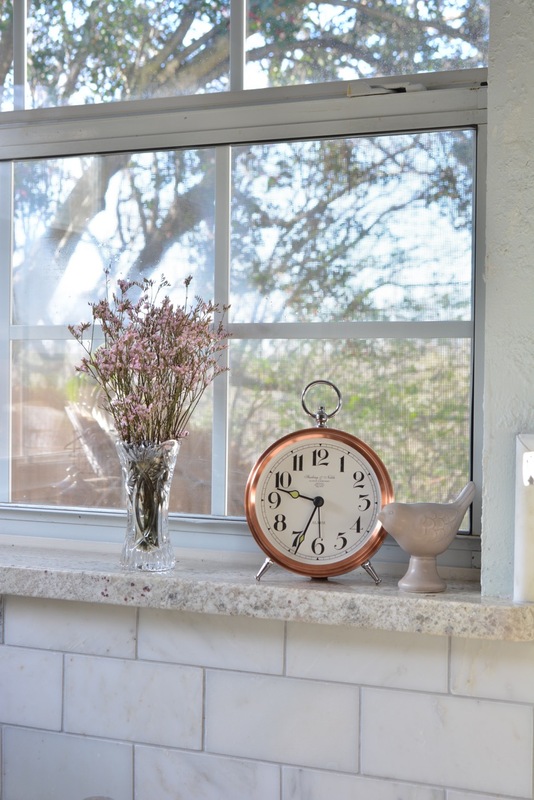 Love the decor in your kitchen. Blue and white is so clean and fresh and with all your accessories looks just amazing! What a great WalMart find, Katie!! 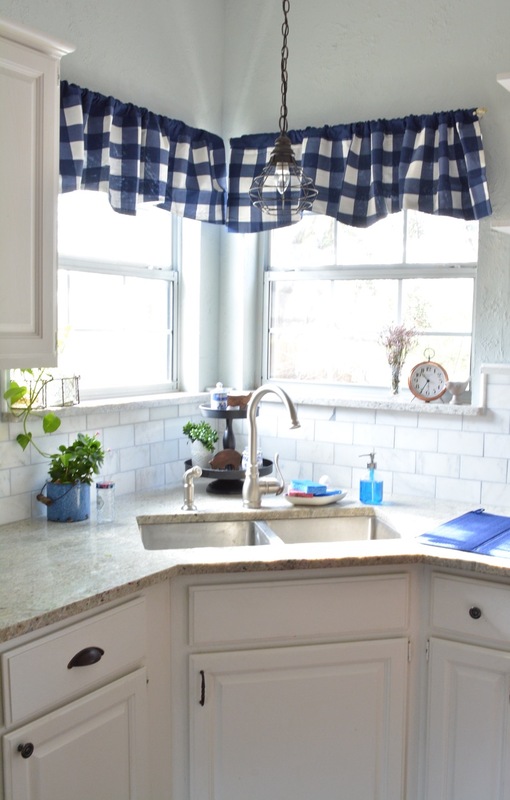 I love checks, and the valances add such a cute charm to your already pretty kitchen. The cow and pig are darling, too! I love your buffalo check valence - anything in blue gets me! I also like the heart hanging by the tote bag. I might just make a similar one this week. Katie!! 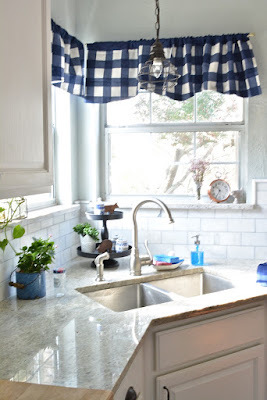 Love the blue and white buffalo check valance!! So pretty and so charming in your Kitchen!! Blue is a "cool" color and represents calmness and your Kitchen exudes that! Very pretty! !